According to the Australian Institute of Health & Welfare, the number of cases of people living with dementia increased by 40 per cent over a decade from an estimated 252,000 in 2006 to 354,000 in 2016. It is estimated that the number of dementia cases may increase to around 900,000 by 2050, reflecting Australia’s ageing population. It is often difficult for carers and family members to understand the challenges faced by people with dementia. This can magnify the sense of feeling isolated and alone, and create issues around care. Recognising the growing need for better understanding around dementia, Churches of Christ (CofC) in Queensland have secured the Australian licence for the Virtual Dementia Tour™ (VDT™) created by P.K. Beville, founder of Second Wind Dreams® (USA). The VDT™ is evidence-based experiential training that aims provide a new level of empathy and understanding, leading to better outcomes for people living with dementia. 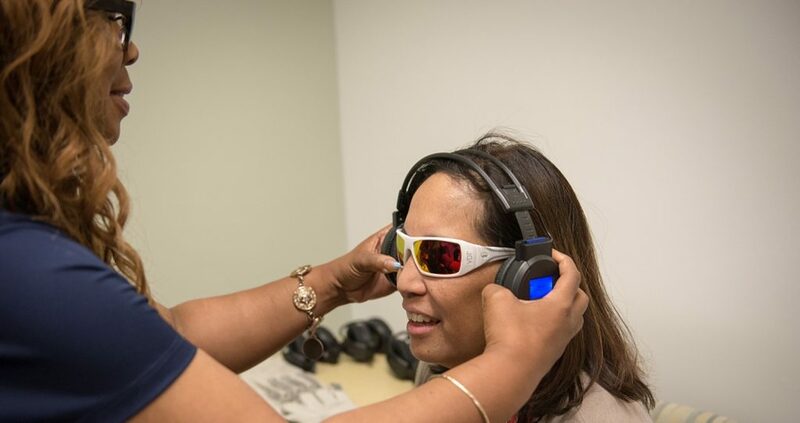 It uses patented sensory devices to alter participants’ senses as they try to complete common everyday tasks. This enables people to experience for themselves the multi-sensory challenges faced by people living with dementia—making it an excellent tool for care givers and loved ones. The new tool will be a game-changer for people living with dementia, changing mindsets and shifting paradigms. Ultimately, the VDT has the potential to upskill people, and change the policies and practices of those who work in the area of dementia—leading to better person-centred care. John Quinn, dementia advocate and a person living with younger onset dementia, says the VDT™ shows people dementia is about more than memory loss. “To promote more awareness, alter peoples’ mind sets, and thereby reduce the stigma of dementia, we need to broaden the lens through which people with dementia are viewed. “TheVDT™ highlights the fact that dementia can present as a number of multi-sensory challenges, and is not only about memory. “Participating in this program not only increases awareness, it also has the capacity to promote greater empathy and sensitivity towards people living with dementia. There is a vision to deliver the program to as many people and organisations as possible—with it already having been delivered to primary health care sectors; aged care providers; the Department of Justice & Attorney General; architectural, building and design firms. Any organisations engaging in customer service, who are willing to invest in their staff to provide the best outcomes for people living with dementia, would benefit from this program. CofC officially launched VDT™ in November 2018. For more information please contact virtualdementiatour@cofcqld.com.au or phone 1300 970 733.